The Town of Rosemère is proud to unveil its new waste materials awareness campaign. The main objective of this campaign is to raise Rosemerites’ awareness of redoubling their waste management efforts. The campaign will be divided into three parts—green waste / fallen leaves and recyclable and organic materials and will run until the end of the fall 2019 season. "For environmental reasons, the City decided that by 2019, plastic bags will no longer be collected and that there will be no more special collections for leaves in the spring and fall. These will now become part of the collection of green and organic waste. This is why it is important to carry out an awareness campaign, so that residents can better understand the various other solutions," stated Rosemère Mayor Eric Westram. 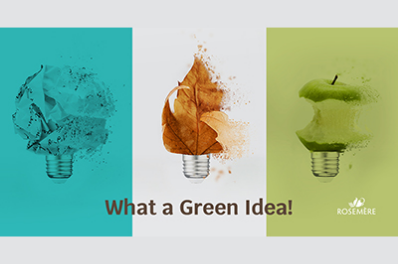 Each of the components of this awareness campaign is linked by the same common thread, the LED light bulb base, in line with the concept that leafcycling and grasscycling as well as recycling, composting, etc., is a green idea! In fact, the Town of Rosemère is encouraging its residents to visit its ECO LIFE micro website (vieecolo.com/en/), where they will find more information on leafcycling, grasscycling, recycling and organic waste. What is leafcycling? In short, it means imitating the genius of nature by simply recycling such organic waste as leaves, flowers, stems and yard waste right on site, at the very same place as the plants. The awareness campaign is beginning with green waste / fallen leaves and will continue during the summer with recyclable and organic materials. It will come back in force in the fall with other communication initiatives to promote leafcycling. And lastly, the Town is inviting residents to attend two talks on leafcycling (11:30 a.m. and 1 p.m.) that will be held as part of Return to Earth Day on Saturday, May 25 at Rosemère Town Hall. A must-do routine… to go green!